From the Selangor Times Issue 13, 25-27 February 2011. Ask Lord Bobo is a weekly column by LoyarBurok where all your profound, abstruse, erudite, hermetic, recondite, sagacious, and other thesaurus-described queries are answered! This week, Ask Lord Bobo ponders what litigation lawyers think about getting paid 400% more this year, and whether laws are meant to be broken. 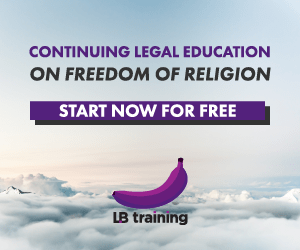 You would assume that most lawyers are overjoyed at the “news” (it was actually a comment made by the Bar Council President, Ragunath Kesavan) that their professional fees would increase by 300%-400%, but really only the most naive lawyers believed it. These stupid ones immediately put down their whisky-glasses and went out to buy that Porsche. The rest of them are split between incredulity, puzzlement, disappointment, and anger. Incredulity; because they are wondering how this conclusion was made. There has been no such discussion or initiative proposed amongst the general members of the Bar. Puzzlement; as to basis of such an increase. Some are questioning its legitimacy. And how does our dear Bar Council President intend to implement this increase, seeing as he has absolutely no power to do so? Disappointment; that there had to be such an announcement in the first place. For matters other than conveyancing, the fees are actually negotiable. The Bar Council does not have any authority to dictate the amount of fees charged. Anger; because they believe it will result in backlash against lawyers who are already being attacked, most notably by the present Chief Justice (this backlash has already in fact manifested in comments in several newspapers). On balance then, the reaction of lawyers has been more negative than positive. On reasoned reflection, this is because of the factors above. But the immediate, and real, reason for the negativity is because all lawyers know that the President was talking out of his rear end. Sadly, what has not been addressed is the ludicrous position that the costs awarded in the subordinate and High Court levels have remained stagnant since 1980. This is important to the public, because the court-awarded costs are what successful litigants get from the losing party. For example, if X sues Y for an unpaid loan of RM40,000 and wins after a full trial, the Sessions Court would award costs to X of approximately RM3,950. However, the professional fees for such a claim would usually be higher by at least RM1,000. Since the 1980s, the disparity between professional fees and court-awarded costs has widened because professional fees are tenuously linked to inflation. Hence, a litigant under this system therefore is usually on the “losing” end even if they win, because they still have to pay the difference between the professional fees and the court-awarded costs (assuming they manage to recover it). And let’s be honest, if you want to win you probably have to get better lawyers, which costs more. Why the Chief Justices have not pushed for the court-awarded costs to be increased and insist on maintaining the same scale that applied 30 years ago is beyond even Lord Bobo! Some anonymous person once said: “Rules are for the guidance of wise men and the obedience of fools.” His Supreme Eminenceness, however, is highly suspicious of quotes from this “Anonymous” bloke. He seems to spout off quite a bit on a lot of topics, and Lord Bobo is of the view that single-word-names should be the exclusive domain of Brazilian footballers. Most of the time, people tend to attempt to shortcut, swerve, sidestep and stretch the law as far as possible. Tolerated lawbreaking is almost always a response to a political failure; the inability of our political institutions to adapt to social change or reach a rational compromise that reflects the interests of the nation and all concerned parties. Socrates, a Greek philosopher surmised the law as such; when you live in a certain territory, under a certain government, under a certain set of rules; and when you benefit from other people obeying said rules, you are obliged to obey that set of rules as well. Citizens owe their government or their fellow citizens or/and both obedience to the law. One follows law absolutely, assuming that all laws are good. St Thomas Aquinas said, “Bad laws are not laws at all.” M.B.E Smith, a modern philosopher, denies that there is any obligation to obey the laws. If a law is good law, it prevents us from doing immoral or wrong acts. Adding a law into the mix does not make the particular prohibited act more “bad”. It is already bad. Law only adds punitive measures or punishments to it. Dr Martin Luther King stated that laws imposed on the minority that the majority does not follow are unjust law. Bad laws deserve no respect, and at times, civil disobedience, as what happened with Ms. Rosa Parks. Back in the 1960s, America practiced complete segregation of the races, from toilets to stadium seats to diners to schools. There was a law in force that when boarding a bus, only Caucasians were allowed to be seated in certain rows, and the African Americans were required to surrender their seats. Ms Rosa Parks, one day on December 1, 1955 had had enough. She refused to surrender her seat. She was charged, went on trial, inspired a 381-day Montgomery bus boycott, and, finally, the Supreme Court’s ruling in November 1956 that segregation on transportation is unconstitutional. In Brown v Board of Education, regarding Linda Brown, the issue was a little African American girl’s right to attend a full Caucasian school only 7 blocks from her house. The school for African American children was a mile away, which forced her to walk much further. The education system was separate for the Caucasians and African Americans, where it is completely separate but yet theoretically “equal” infrastructure. It was argued that the infrastructure for the African American children was often sub-par, and infringed the rights of all African American children to education. The Supreme Court required the desegregation of schools across America. It was a landmark case which showed that where a law isn’t necessarily moral or right, it should not be followed. However, H.L.Hart, the law positivist, admits that although morality and law oft find themselves in the same bed, they are not necessarily linked. Morality is what gives the law legitimacy, and the justification to enforce punitive measures/punishments. If a piece of law or legislation has bad morals behind it, should it be followed? Both morality and law deal with controlling human behaviour, and the order of civil society, but the exchanges or human interactions are intricate and complex. So, are laws meant to be broken? No, of course not. But then, laws are meant to be properly conceptualised, discussed, drafted, and implemented. Which they are not. So the question really should be “is it okay to break bad laws?” — which goes into the realm of morality, and the subjectivity of what is “good” — and if Lord Bobo were to reveal the truths about these weighty matters to humankind, there would be an almighty brain-splattering taking place. Let’s not. If you need to decide on something, remember: “Don’t do anything Lord Bobo wouldn’t do.” — and if you’re thinking of something specific, just Ask Lord Bobo. emailing [email protected], stating your full name, and a pseudonym if you wish the question to be published anonymously (and a good reason for anonymity). 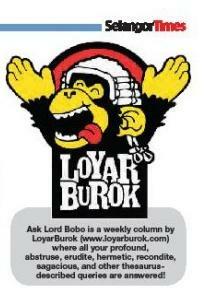 tweeting your questions by mentioning @LoyarBurok and using the hashtag #asklordbobo. 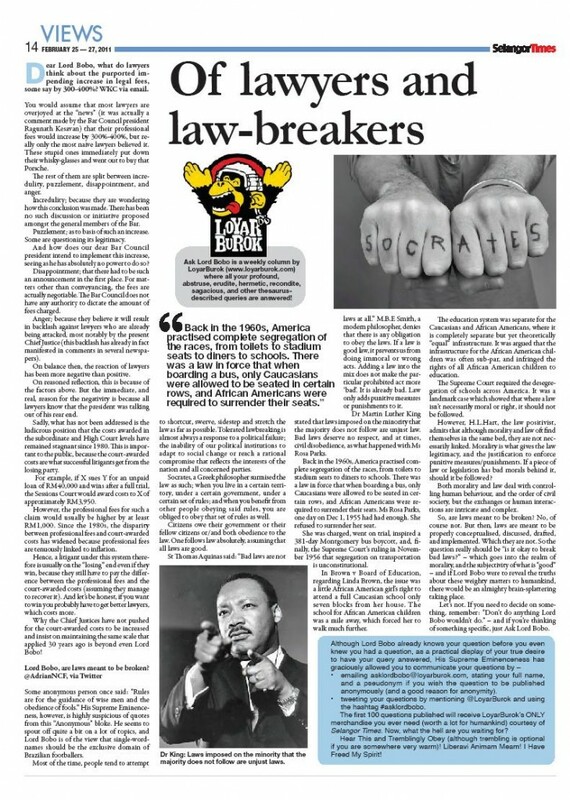 The first 100 questions published will receive LoyarBurok’s ONLY merchandise you ever need (worth a lot for humankind) courtesy of Selangor Times. Now, what the hell are you waiting for? Hear This and Tremblingly Obey (although trembling is optional if you are somewhere very warm)! Liberavi Animam Meam! I Have Freed My Spirit! Posted on 4 March 2011. You can follow any responses to this entry through the RSS 2.0.